And it’s back! Got a mix for you today as far as release dates go, some out now and some that don’t even have a release date yet, but there are a couple of them that may have made me bounce up and down in my chair and squeal like a little girl when I saw them, so without further ado: ta-da! I loved the cover for Kendare Blake’s Anna Dressed in Blood. It was all eerie shades of white and grey with a few vibrant strokes of black, and eye-catching violent sweeps of red. It told you right off the bat that this was a ghost story, and a violent one. 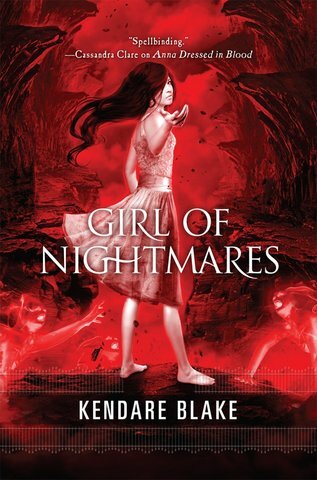 Well, Anna’s back on the cover of Girl of Nightmares (no release date yet) and- just a guess- I’d say she’s back with a vengeance. This cover is like a photo negative of the first. Here it’s the reds that hold most of the page, with darker shapes in the distance that make it unclear if we’re going through a hellscape or mountains. Either way, the cliff edges are tall and curling in, almost claustrophobic, and clearly an indication of danger. My guess would be hellscape, given the not-entirely there figures in the foreground, reaching for Anna. Here’s the question, though: are they reaching to her for help? Or to offer more danger? You can’t really tell from her face or her body language; if she’s afraid, she isn’t showing it. Her exact expression is hard to define- it could be a lot of things- and the way she’s holding out her hand is equally ambiguous. Is she extending an invitation? Or a dare? Just as the use of red in the first cover drew your eye to the bloodstains, here it’s the unexpected white of Anna’s dress that pulls in your attention. A sweet girl in a cute white dress…in a hellscape? It almost dares you to find out why. Sadly, we’ll probably we waiting until August for this one. Here we’re going to switch to a contemporary (I know, how often do I do that, right?) but this is one that held be spellbound when I first saw the cover. At first glance, it’s easy to miss what this is. An x-ray of a flower, maybe, or a magnified fractal image of a snowflake. But look again- those are dancers. People made to look so identical that they all blur together into a single design. Welcome to the world of ballet. It isn’t just the image is harmonious. It isn’t just that the repeating pattern lulls the eye into tracing the arms. Fractals are intriguing, they’re soothing. Here the image is delicate and elegant- and also a little frightening. Because again: THOSE ARE PEOPLE. And to create an image like they, they sacrificed all individuality, everything unique about them, to blend against the larger design. Ever watched a ballet and wondered how they survive being made to dance all the same? What about making your life all the same as well? I don’t normally go for contemporary, but this cover alone is enough to make me want to read this book. 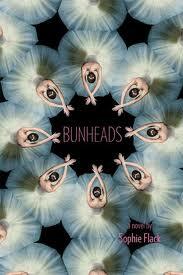 Bunhead, by Sophie Flack, is out in stores now. To those familiar with this next author, this cover is QUITE a switch from her others- which gives some interesting promise that the story will be, as well. I love instruments of time on covers. Hourglasses, watches, clocks, even sundials, anything that gives the impression that time is of the essence. That being said, I don’t know that I’ve ever seen it come across in such a fantastically creepy manner. It isn’t just that the hourglass is filled with sand rather than blood- it’s that there’s blood on the outside of the glass, too. The two pieces are nearly equal in volume so whatever’s happening, there is a balance to it. Hourglasses, once empty, turn over to start the new process. But given that blood, unlike sand, is a perishable substance- do you suppose it needs to be replaced once it runs out? I love the background here, largely because it gives the ghost of images without destracting from the main focus. The vine-like designs in the upper corners, the suggestion of a face on the left side. It doesn’t pull from the hourglass in the way a busier background might, but neither does it detract in the way a completely plain background would. It is, like the levels of blood in the hourglass, the perfect balance. 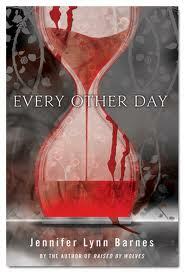 Every Other Day, the first of a new series by Jennifer Lynn Barnes, is out December 27th of this year. 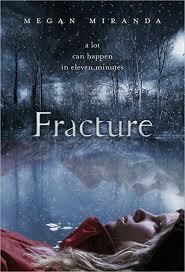 Starting at the top of the cover of Fracture by Megan Miranda, we get a winterscape, cold and grey, skeletal trees caught between slumbering and dying, with a light dusting of snow. Bleak, relentless, frigid…already not a promising sight. Then, as our eyes travel down to the base of the cover, we see what might be a ghost, might be a reflection, of a girl. Her face is expressionless, caught in that same in-between aspect as the trees beyond her. Then, just a little further down, we see the girl herself, caught against the sheet of ice on the lake in such a way that she might almost be under it. She isn’t- but she might have been once, leaving behind the ghost or the echo or the reflection of the girl who looks back at her. Despite the parka, there’s something cold to her- something that has a lot to do with why she’s lying on snow or ice out in the middle of the woods. This is a book where Death is a constant shadow, reaching out a hand as skeletal as the bare trees to try to keep what it has claimed. What we’ll have to discover is what the consequences of escaping Death once might be. This comes out 17 January 2012, right in the dead of winter. Last one for today, one I have been looking forward to so, SO much. 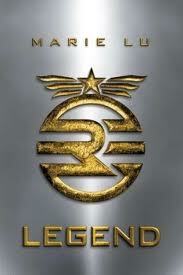 Even before you read the jacket copy, you know Marie Lu’s Legend has a military rigidity to it. It’s all polished steel like a gun barrel, with stark, sharp-edged contrast in the form of antique gold like medals and insignia. And that’s it. Spartan, severe, no frills or extra colors, it’s like a punch to the stomach if you step out of line. We are not going to go into this book expecting softness and cuddles. Look at the actual insignia though. The left side of it forms a stylized R (presumably for Republic), but look at the right side. In order to maintain the design, in order to keep the visual appeal without disrupting the identifiable nature of the R, there’s a free-floating piece. Essential to the design, but probably rather difficult to pin in place. Necessary, but troublesome. That free-floating piece? That’s our story. How that free-floating piece works within the larger design, the fragility of a portion without connection to the whole, that’s what we’re diving into the gun barrel to find out. If you’re like me, 29 November 2011 can’t come quickly enough. Any covers you’ve seen in the past month that you want to share? Anything out now or upcoming that you think sells you on trying the book? Share below!